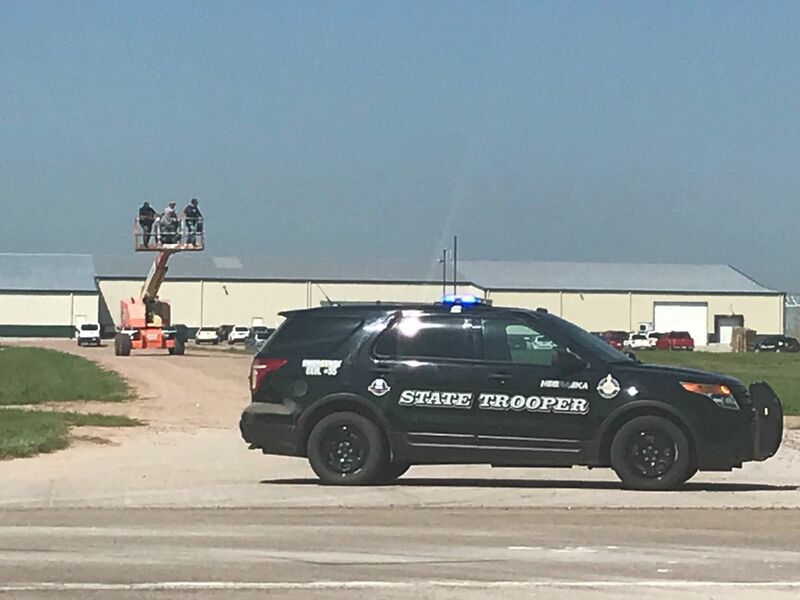 Law enforcement officials use a lift truck to look for people on the roof of a greenhouse in O'Neill, Nebraska, the site of immigration raid on Wednesday. LINCOLN — The attorney for the alleged ringleader of a "slave labor" operation involving workers in the country illegally has asked a judge to bar federal officials from using such language. Accused ringleader Juan Pablo Sanchez Delgado also pleaded for mercy for the 16 family members and business colleagues in Holt County also charged with exploiting immigrants through a staffing agency called JP & Sons. Ross Pesek, an Omaha lawyer, said Monday in a court filing that that Delgado has been "smeared" by public comments by officials with Immigration and Customs Enforcement that the O'Neill restaurant owner was involved in human trafficking. Delgado, Pesek said, was running a legitimate staffing agency, JP & Sons, that deducted fees and taxes from workers' paychecks like similar employment firms. His client was a respected businessman in O'Neill, Pesek said, adding that ICE "wanted to take down 133 people and they needed someone to blame." An ICE official on Monday said he could not comment on the filings in U.S. District Court because they involved a criminal case. Spokesman Shawn Neudauer said that the raid on O'Neill area businesses was prompted by an alleged criminal conspiracy involving Delgado and his family that provided immigrant labor to local businesses. Neudauer has characterized the operation as a "slave labor" enterprise in which immigrants owed money to "the company store." Fees and taxes were allegedly deducted from paychecks that could only be cashed through Delgado's businesses, and taxes were never paid, Neudauer said. In the raid that led to the arrests of Delgado and 16 other co-conspirators, 133 illegal immigrant workers were also detained. About half remain in ICE custody awaiting deportation hearings. Pesek, in his filings Monday, requested a hearing before a judge to bar federal officials from characterizing Delgado's operation with terms like "slave labor." He said that his client has not been charged with human slavery, and that none of the immigrants employed through Delgado's firm have "witnessed slavery, abuse or human trafficking because this is a false and defamatory allegation." The comments, he said, could prevent his client from getting a fair trial. Delgado, in a separate court filing, said that both the current and past Holt County attorneys helped him set up the limited liability corporations that ran the staffing agency, and that they, and others in the county, "taught me how business is done in rural America — which does not include slavery, abuse or theft." He acknowledged in the court document that he entered the U.S. illegally 19 years ago by crossing the Rio Grande River in an inflatable swimming pool, but he said his family, and business partners, should not be punished for his actions. "The prosecution of my wife, sister, brother, son, sister-in-law, brother-in-law and niece is cruel. I beg for mercy for them," Delgado wrote. The motion asked for a hearing to allow the pre-trial release of his niece, Anayancy Castro, because she has two children and was not involved in JP & Sons. THROW THEM ALL IN FEDERAL TENT CITY ON FEDERAL LAND WITH A PANEL OF JUDGES! SERVE TIME AND DEPORT THEM ON THE SPOT! AMERICAN TAXPAYERS WANT MERCY FROM THIS UNRELENTING INVASION OF OUR COUNTRY! Another example of slave labor being disguised as helping ..